The first time you connect your computer to your Fusion Robot, you may be required to provide a security key. This security key will be supplied by Modern Robotics Inc. as part of your Fusion kit. At the time of writing (January 2019), this key is mrifusion. 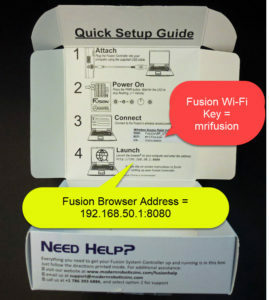 It can be seen inside the lid of the Fusion System Controller Box that comes with your Fusion kit. The video below shows how to use Fusion’s inbuilt Wi-Fi to link a Fusion Robot to a computer. In this example, the computer is a Windows 10 PC, and the “Network Security Key” mentioned in this video is mrifusion. Modern Robotics also have information about connecting your computer to your Fusion Robot via Macintosh, via Linux, via iOS and via Android. You may need the SSID of your Fusion Robot. To make reading on small screen easier, the SSID and Network Security Keys are shown enlarged below. Fusion Robot SSID used to connect Fusion Robot to iOS and Android computers. One of the unique things about a Fusion robot is that, as well as acting as a robot, it also acts as a server with an inbuilt Wi-Fi link. Laptops, desktop PCs, tablets or smart phones can connect to the Fusion robot using this Wi-Fi link. It is almost as if the Fusion robot is its own Wi-Fi hotspot, except that the Wi-Fi connection is not to the Internet, it is just to the Fusion robot itself. In normal operation, neither the Fusion robot nor the computer need be connected to the Internet, (but can be if the student really desires this to be the case). This ability to be able to operate without a connection to the Internet can be a major advantage when the Internet connection is a problem, either because of slow Internet speed or because the Internet is simply not available in the student workplace. It can also be an advantage when a school is concerned that the student may have contact with some of the less desirable content on the Internet, and therefore has banned connections between student computers in the school, and the Internet. In both these circumstances, the Fusion robot can be used and programmed independent of any Internet access. If you have access to the USB version of our tutorials, these can also be used independently of any Internet access.